This inspiring and beautifully photographed cookbook brings the vibrant and flavorful cuisine of Thailand to home cooks everywhere. Featuring a range of recipes that explore this beloved cuisine’s four main groups of taste—hot, sweet, salty, sour—author Tom Kim shows how simple it is to prepare authentic Thai dishes in your kitchen. My Thai Cookbook presents the easy-to-follow tenants for preparing authentic Thai food. In these pages, you’ll find all the traditional dishes and specialties of Thailand, from favorite snacks and street food to curries, noodle salads, and soups— plus all the basics like curry pastes, relishes, hot sauces, marinades, and more—simplified for contemporary home cooks. The well-curated recipes respect tradition but have been adapted to the modern kitchen. You’ll also find features on must-have spices, menu ideas, and a glossary of key ingredients. 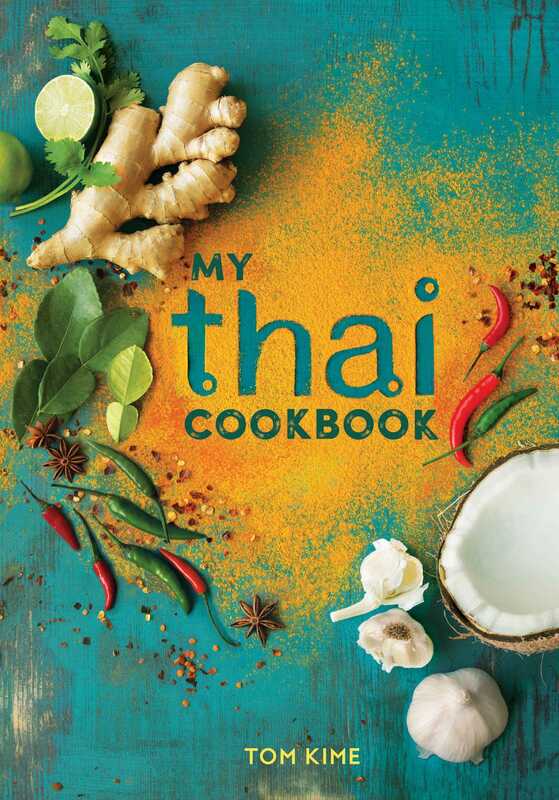 Discover the hallmark flavors, dishes, and accessibility of Thai cuisine with My Thai Cookbook. 1. Heat the vegetable oil in a wok over medium heat and fry the onion until softened, 1–2 minutes. Add the garlic and chiles and fry for another minute until fragrant and aromatic. 2. Add the sliced chicken and stir-fry briskly until the chicken starts to change color, then add the shrimp. Stir-fry briskly for 2 minutes, then add the eggs, cooking them on the upper edges of the pan so that you get a thin omelet. 3. Splash in the fish sauce, then add the rice and continue to stir-fry for 3 minutes. Season with black pepper and lime juice. 4. Add the cilantro and spring onions, then quickly transfer to a large serving dish.